Drosophila suzukii (Diptera, Drosophilidae) is an exotic species, endemic to Asia and currently a pest to small and stone fruits in several countries of North America and Europe. It was detected in 2013 for the first time in South America, in the south of Brazil. Unlike most drosophilids, this species deserves special attention, because the females are capable of oviposit inside healthy fruits, rendering their sale and export prohibited. Despite the confirmed existence of this species in different states of Brazil, this insect is yet been to be given the pest status. Nevertheless, the mere presence of this species is enough to cause concern to producers of small fruits and to justify further investigation for it’s control, especially chemical control for a possible change in status. Therefore, the goal of this work was to evaluate, in laboratory, mortality of D. suzukii adults and ovicidal effect when exposed to different insecticides registered for species of the Tephritidae and Agromyzidae families in different cultures. The insecticides deltamethrin, dimethoate, spinosad, fenitrothion, phosmet, malathion, methidathion, and zeta-cypermethrin resulted in mortality to 100 % of the subjects three days after the treatment (DAT). Regarding the effects over eggs, it was established that the insecticides fenitrothion, malathion, and methidathion deemed 100 % of the eggs not viable, followed by phosmet and diflubenzuron, which also caused elevated reduction in the eclosion of larvae two DAT. Derechos de autor 2017 Sociedad Colombiana de Entomología – Socolen. 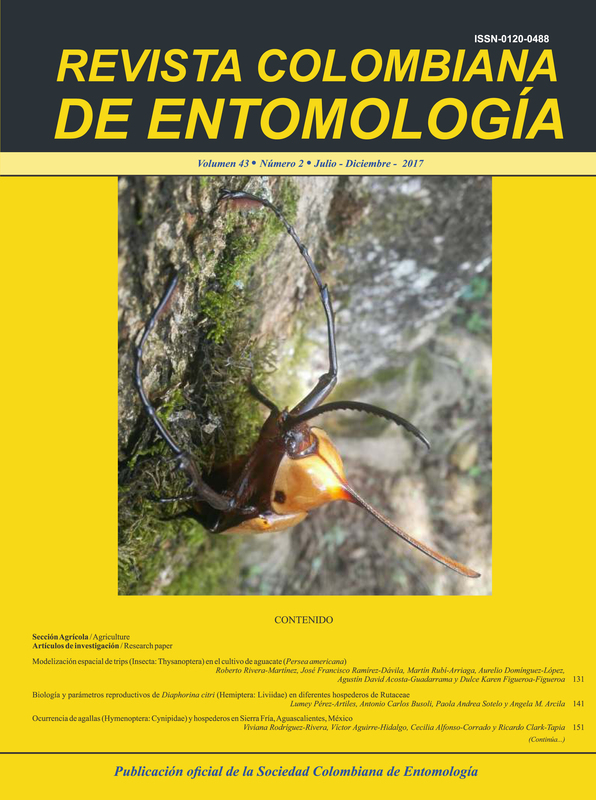 © Los derechos de autor de la Revista Colombiana de Entomología pertenecen a la Sociedad Colombiana de Entomología. La Sociedad no se responsabiliza de las ideas emitidas por los autores. Ninguna publicación, nacional o extranjera, podrá reproducir ni traducir los artículos o los resúmenes, sin la previa autorización escrita del editor. La persona interesada en poseer una copia de un artículo puede solicitarla gratuitamente al autor cuya dirección aparece en la primera página del mismo o en la web o solicitarla a través de oficina@socolen.org.co.